When I was a kid my mom used to make a white loaf cake that she put glace cherries into…it was one of my favourites (although I am a chocolate cake girl through and through!). 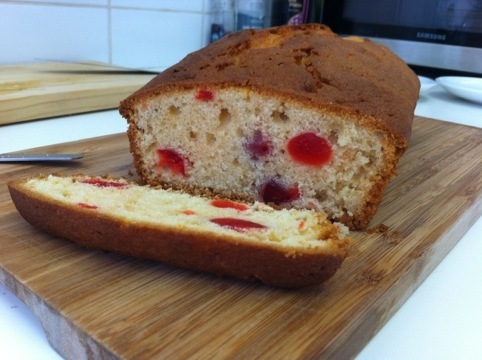 I remember eating this cherry loaf straight out of the oven, still warm and with the sweet taste of the cherries popping into my mouth. It’s been years since she made it and it’s never occurred to me to give it a try…until now. I got the recipe from her on our last visit home and have had it safely scribbled in my Moleskine notebook waiting for opportunity to strike so that I could give it a whirl. It’s called a “Quick Mix Cake” in my Mom’s old school recipe book, perhaps a Woman’s Institute one or something of that era. It’s really simple and as the name claims – quick! I also tried to make half with cherries (for me) and half with walnuts (for my boyfriend who is not a cherry fan!) – this worked ok, except that the nuts sunk to the bottom a little bit. Here’s the recipe if you’re keen to try it out… You can pretty much add anything you like to the mixture, lemon zest, nuts, orange peel – or just make it plain! Put all the ingredients (excluding baking powder and cherries) in a bowl and beat well. This goes against most of the “rules” of baking, in terms of certain ingredients needing to be mixed together etc etc, but so long as your ingredients have been brought to room temperature – especially the butter, it’s fine! Chop us your cherries or whatever else you’re adding, roll in a little flour and add into the mixture. Pour into a greased and floured loaf pan and bake at 180 C for 45 minutes before opening the over door. Best eaten warm from the oven 🙂 Enjoy!